Laura Bolton, Ben Avila, and Kelly Mahoney are teachers in the Central Unified School District in Fresno, California. Laura is at Saroyan Elementary School, has been teaching for 15 years, and has taught math using Cognitively Guided Instruction for the last 11 years. 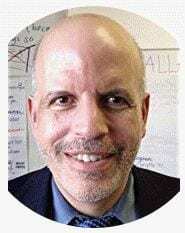 Ben is at Teague Elementary School, has been teaching for 15 years, and has taught math using Cognitively Guided Instruction for the last 11 years. Kelly is at River Bluff Elementary School, has been teaching for 12 years, and has taught math using Cognitively Guided Instruction for the last 10 years. They are members of the Instructional Leadership Corps, a collaboration among the California Teachers Association, the Stanford Center for Opportunity Policy in Education, and the National Board Resource Center at Stanford. 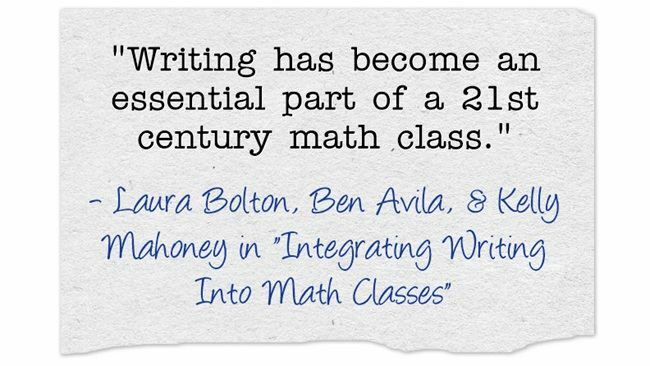 Writing has become an essential part of a 21st century math class. It is no longer enough for students to merely solve twenty problems on a worksheet and regurgitate answers. Students need to explain their thinking and justify their answers. According to Common Core Mathematical Practice Standard Three students must construct viable arguments and critique the reasoning of others. Writing can take on many purposes and forms. 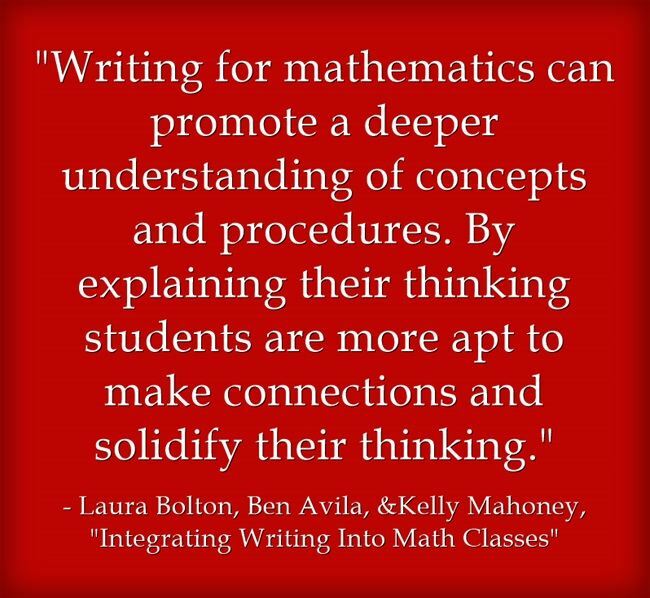 Writing for mathematics can promote a deeper understanding of concepts and procedures. By explaining their thinking students are more apt to make connections and solidify their thinking. Explaining their thinking to others is a good way to sort through their understandings and misconceptions. The new standards ask students to apply mathematics to everyday life and situations. Students can write to explain how their strategy works in a real world context. They can explain why their solution strategy is the best and most efficient path to an answer. Or explain why their answer given a multitude of possible answers would be the best choice in a given scenario. Writing in mathematics classrooms is also a good form of assessment. By having the students write you can get to know what students are thinking. Teachers may know if a student got the correct or incorrect answer, but that doesn’t always tell you the full picture. By having students write their explanation for their answers you can better formatively assess their understanding and tailor lessons to your students’ strengths and weaknesses. At the kindergarten and first grade level, writing in mathematics will and should look different than in second grade and above. Young children can begin writing in math with simple drawings with labels. Labels could be words and/or pictures. Sentence frames and math word banks can help young students with basic descriptions of their solution strategies. Annotation apps such as Seesaw and Explain Everything can help kinder and first grade students record explanations of their thinking in greater detail before their writing skills have fully developed. Students at all grade levels can and should write during math class. Younger students can benefit from learning to label their work and writing sentences to clarify their answers and strategies. The written rehearsal of strategies helps older students consolidate their thinking and strategies, pushes them to think reflectively about their own and their classmates’ explanations or strategies, and can provide teachers with a means of assessing a student’s understanding and misconceptions. California Department of Education. California Common Core State Standards: Mathematics. Edited by CDE Press. Sacramento, CA, 2014. http://www.cde.ca.gov/re/cc/. Instructional Quality Commission. Mathematics Framework for California Public Schools: Kindergarten through Grade Twelve. California Department of Education. Sacramento, CA, 2015. http://www.cde.ca.gov/ci/ma/cf/mathfwchapters.asp. Research does indeed seem to show that K-12 students perform better on assessments of mathematical ability when writing is integrated into math class (Evans, 1984; Thayer & Giebelhaus, 2001). However, a more-carefully controlled study by Porter and Masingila (2000) that contrasts a group who engaged in writing to learn mathematics with a group who used similar activities that did not utilize writing but still triggered thought and discussion about mathematical ideas, found no significant differences between the two groups. Most likely, it is not the writing per se that improves performance but is instead the deeper conceptual thinking that the type of writing assignments studied triggers. Elaborative generation (generating an explanation for why something is true) and self-explanation (explaining why you are engaging in each particular step of an established procedure) have been shown to improve students’ memory, so writing activities that cause students to engage in such practices can take advantage of the benefits of these strategies (Dunlosky et al., 2013). However, educators should be wary of haphazardly adding writing into math classes because writing that does not lead students to think more deeply about concepts and procedures is not likely to lead to any improvements in their mathematical performance and understanding. For example, Baroody and Ginsburg (1995) found that the majority of writing in math classes was merely an exercise in the reproduction of textbook text. Such writing neither engages students in making connections among mathematical concepts nor requires the depth of understanding necessary to reproduce concepts and definitions in students’ own words. Teachers may find writing assignments a useful tool for engaging students in deeper conceptual consideration of mathematical concepts, but teachers must be careful that the type of writing they assign actually engenders such conceptual thinking. Furthermore, teachers who already incorporate into their lesson plans guided discussions focusing on connecting various mathematical concepts may have no need to supplement this through the addition of writing assignments. Baroody, A., & Ginsburg, H. (1995). Children’s mathematical learning: A cognitive view. In R. B. Davis, C. A. Maher & N. Noddings (Eds. ), Constructivist views on the teaching and learning of mathematics, JRME Monograph Number 4 (3rd ed.) (pp. 51–64). Reston , VA : National Council of Teachers of Mathematics. Dunlosky, J., Rawson, K. A., Marsh, E. J., Nathan, M. J. & Willingham, D. T. (2013). Improving students’ learning and comprehension by using effective learning techniques: Promising directions from cognitive and educational psychology. Psychological Science in the Public Interest, 14, 4-58. Thayer, J., & Giebelhaus, C. R. (2001). Integrating writing to improve math achievement [Abstract]. 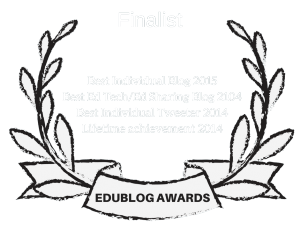 Mid-Western Educational Researcher, 14(2), 11-16. Retrieved from https://eric.ed.gov/?id=EJ631501.